Let's not mince words - Sprawlopolis is a fantastic little puzzle of a game. Whether played solo or cooperative, this pint-sized city builder has more staying power than games ten times more complex. We love Button Shy – Jason Tagmire’s family-run small game company has found a niche (hah) with its wallet-sized micro-games, and they do a good job of curating a wide variety of pocket-sized titles with a wide variety of themes and mechanics. One of our favorites, Circle the Wagons, is a clever drafting/placement game with fantastic replayability, thanks to a wide variety of randomly chosen scoring objectives. Designed by Steven Aramini, Danny Devine, and Paul Kluka, Circle the Wagons is a great, light, go-anywhere card drafting micro that has had a permanent spot in my backpack since I got our copy. Well, I think it’s got some competition on the horizon. Sprawlopolis is clearly inspired by the core concepts behind Circle the Wagon (which makes sense, coming from the same designer trio), however, Sprawlopolis eschews any thoughts of competitive drafting, instead touting itself as a ‘solo & cooperative’ city building game. Promising a filling experience despite its micro stature, can lightning strike twice for the Circle the Wagons gang? 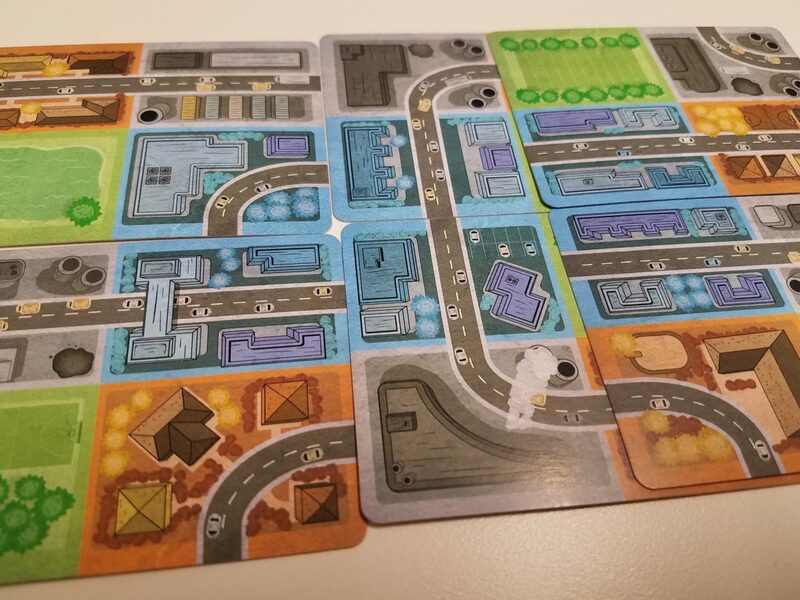 The basics (beyond which there isn’t much) go like this – Sprawlopolis is a game about building a city, which you will do by laying cards down into (and onto) the city grid. Cards can be placed beside or even atop other cards. 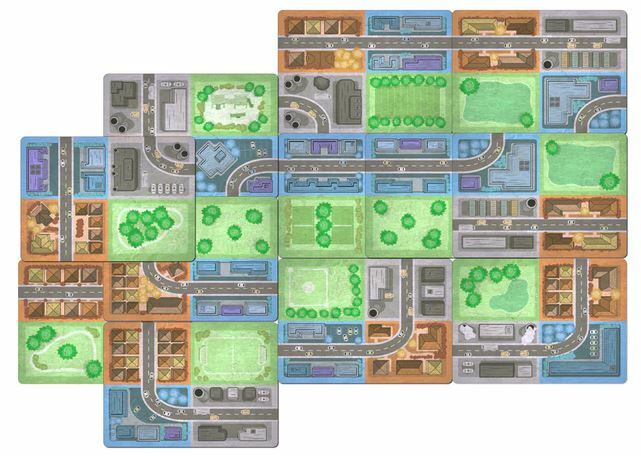 Each card has 4 zones, and cards must be orthagonally connected to the city in some way. Cards can be placed so that they overlap, covering previously placed blocks with new ones. You will score a point per zone in the largest contiguous block of that zone in your city. Like so. That big park, for example, is currently worth 4 points. The other three rules, and this is where the brilliant replayability comes in, are randomly determined at the start of each game. Each one is different, relating to either the relative location of zones to each other, or where they are in the city, or a mess of other potential scoring mechanisms. Each scoring mechanism has an associated number, and each game you’ll take your three randomly-drawn scoring cards and add up their numbers. These will give you a target value you’re aiming to hit during the course of gameplay. I particularly like this little feature, because it gives you a sense of how well you’re doing in this puzzly little game. Playing with these 3 goals? You’re doing well if you score 28 points or more. Sprawlopolis is, simply put, great. It’s a master class in getting more out of less, providing a quick, engaging little puzzle that changes a bit with each play. 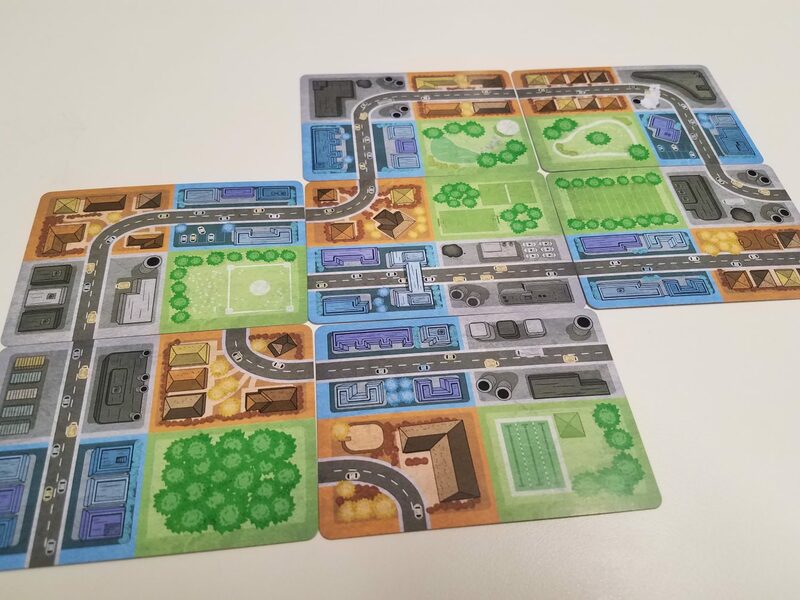 The aesthetic of our prototype is already very easy on the eyes, too, and I love the way cities look as they come together on the table. 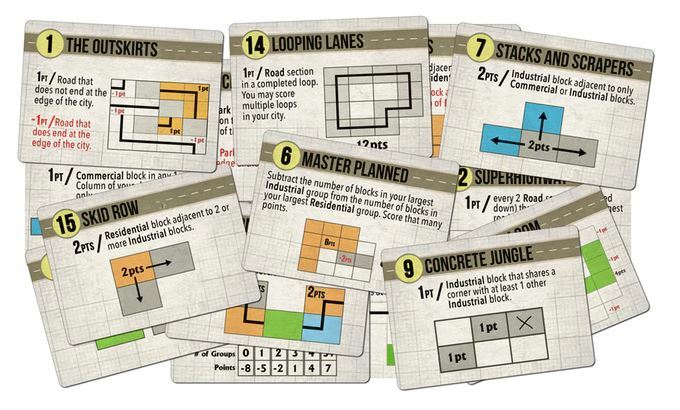 Sprawlopolis is a game about logic and balance. You have a set of goals you’ll aim to shoot for, but the ‘roads’ complication is just enough of a stumbling block that it’ll make you consider each placement. It’s not a complex or fiddly game at all, but it gets you thinking, and we really appreciate that. Often, the best way to limit the impact of roads is to string them together. But of course, that might screw up your other goals. 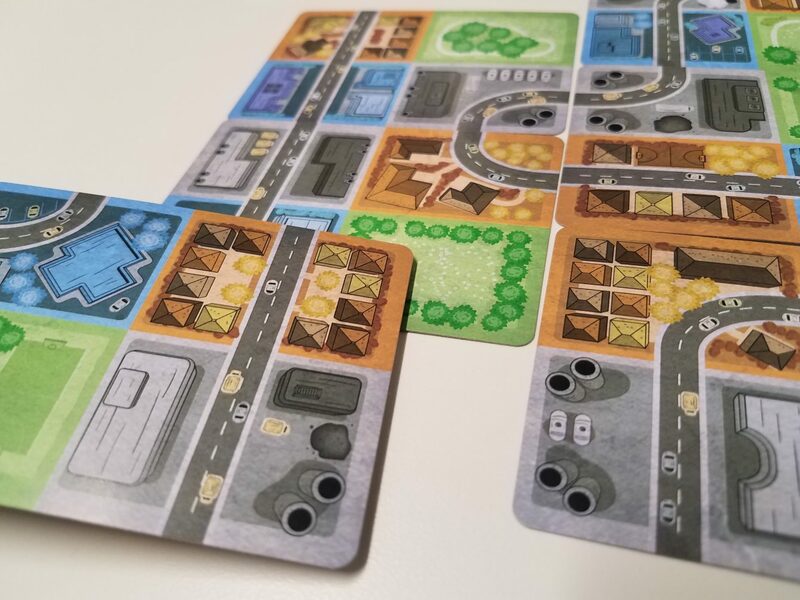 Overall, we think Sprawlopolis is just great. It’s light but not weightless, portable but not disposable, and engaging without being ponderous. And at $10, honestly, it’s a phenomenal value. 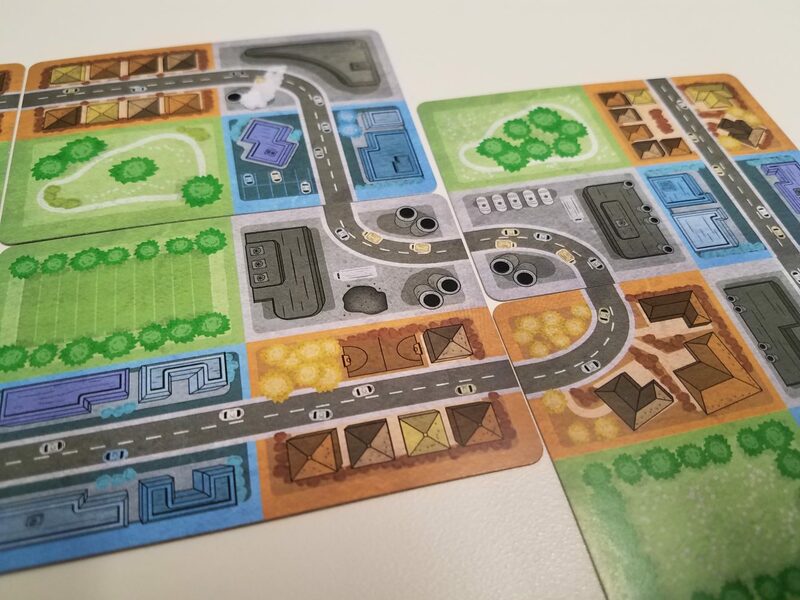 We highly recommend checking out the Sprawlopolis Kickstarter, where you can get not only Sprawlopolis but a mess of other Button Shy games besides! An awesome looking game from Steve Aramini, Danny Devine, and Paul Kluka. I really enjoyed this review…very informative.